Just as a follow-up to my review last month of the New Zealand Pinot Gris, ‘Paikea’, I must mention a fellow contender from the same grape variety as a well-nigh perfect accompaniment to oriental food. A taste-tingling experience encountered recently and jointly across a set meal taking in a selection of classic Chinese dishes at ‘The Rice Bowl’, Manchester: Dashwood Pinot Gris (Marlborough) 2017 – available through Matthew Clark Wines of Bristol. Why? It embodied many of the virtues of last month’s offering, coupled with super clarity and a bright cleansing ‘cut’ of acidity on the palate. My fellow diners were as impressed by it as I was, hence its mention here. But now, onwards and somewhere different! The recent early tinges of autumn point to that ‘season of mists and mellow fruitfulness’ ahead and reveal equally how predictable I have become in my choice of a wine to echo the seasonal russet colorations. For me, the warmth, ripeness, richness and sheer food friendliness of Tuscan wines is beyond compare. No wonder I want to share my experience of them here. 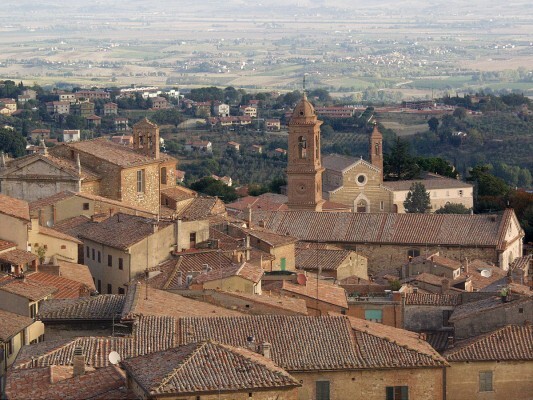 Taking the Chianti country around Florence as a starting point, I’m now travelling some seventy-odd miles south east to the little town of Montepulciano via. either the Superstrada 222 by way of Poggibonsi and Siena, or I could have chosen the quicker, the A1/E35, the slightly more direct route bypassing Arezzo to this unique area of Tuscan wine production. But who wants to hurry through the magical vine-clad countryside of this famed region anyway? As in Chianti Classico the principal grape in the mix at Montepulciano is Sangiovese, though the local clonal variant here calls itself Prugnolo Gentile – a grape essentially with plummy scents and flavours offering wines of more consistently high standards vintage to vintage than those generally produced within the diverse sprawl of the Chianti zone. The top rated ‘Vino Nobile di Montepulciano’ – Tuscany’s very first wine at DOCG level incidentally – calls for a minimum of 80% Prugnolo, but 100% versions are even produced, minus the also-ran additions of Canaiolo and Mammolo as found in Barone Ricasoli’s initial matrix for the blend in ‘Chianti-shire’ in the hills and valleys further north. 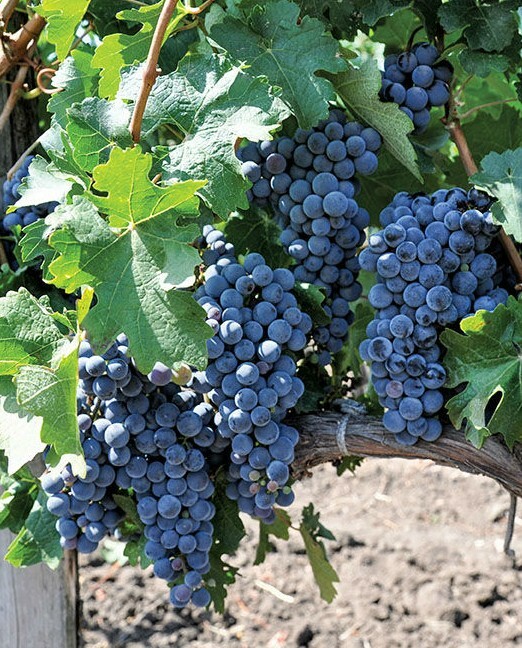 Montepulciano Rosso is produced from slightly higher yields than its DOCG leader of the pack but may, in some circumstances, contain a proportion of declassified ‘Nobile’ wine. My choice for October bears the name of one of Montepulciano’s most celebrated producers, the Dei family, with Maria Caterina Dei, grand-daughter of the Cantine’s founding father at the helm – the wine under discussion being the cadet version of Vino Nobile di Montepulciano DOCG i.e. the humbler Rosso di Montepulciano DOC 2016, a wine crafted in this case from 90% Prugnolo (Sangiovese Grosso), with 5% Canaiolo and 5% Merlot and finished in Slavonian oak. 2016 was a good if smaller-yielding vintage in Tuscany with well-defined extraction of fruit characteristics. … my own cue then to look at the evidence in the glass I’m currently cuddling. The glass, tilted, shows the wine’s translucency from a deep limpid cherry colour to a more russet tinge approaching the glass’s edge. The nose suggests warm earth and hints of spicing suggestive of clove or cinnamon, then carried directly through to a dry but wonderfully soft-feeling first impression on the palate with – on the back taste – the gentlest developed tannins on the tongue, lending structure to the whole. To call this wine ‘the taste of Tuscany’ is pretty meaningless in itself, but it appears as a shining example of what Montepulciano wines are all about in the hands of a skilled producer. Despite not sharing the complexity, weight, or the degree of perfume of its senior partner the Vino Nobile, the food friendliness of this beautifully crafted ‘Rosso’ deserves to be enjoyed and savoured simply for its delicious self. NB: As an aid to consistency of approach, all wines sampled for this blog site are tasted and described from 25.1 cl ( 7 ¼ Oz. U.S) ISO glasses as used in professional tastings. It's been a great introduction, with great variety and giving a broad basic knowledge.